A lot of audio interfaces have come and gone here. My favorite remains my trusted MOTU 828. Why? It has rock-solid drivers that have never caused trouble on Mac or PC, and it sounds terrific. Unfortunately, it’s also rather big and heavy as a full rack-space unit. That’s why I’m excited to see MOTU is shipping its bus-powered FireWire-based UltraLite, which has more features than my old 828 in a fraction of the space. 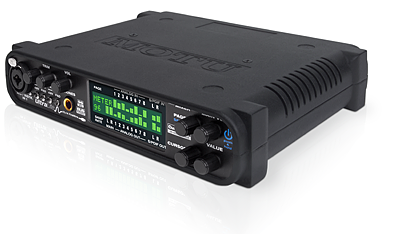 2 mic/instrument inputs with mic pres, plus 6 line ins for 8 inputs; 10 analog outputs, S/PDIF ins and outs for digital, and a dedicated headphone jack. Dedicated headphone jack, which is essential for monitoring Ableton Live mixes, click tracks, or anything else that requires a separate headphone feed. And I don’t want to mention any names, but I’ve had trouble with some other portable audio interfaces: funky drivers, sub-par MIDI performance, lame mic pres. I’ve got high expectations for the MOTU gear; I can’t wait to give this one a spin. Compatibility: Mac Core Audio (including Intel) and PC (ASIO and WDM). Now, if only my PC could hack bus power over FireWire like my Macs.